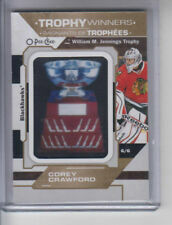 2005-06 upper deck ice premieres rookie #260 corey crawford 0042/2999 bgs 10 pristine !! With 3 10's !!!!!! For multiple auctions winners, $0.50 will be added for each auction won. 2012-13 Panini Limited Crease Cleaners Jersey Patch #31 Corey Crawford 2/5 - Chicago Blackhawks. Imperfections vary from centering, surface, edges and even corners. This is why it is very difficult to get a perfect 10 on any cards that you have graded. 2013-14 Panini Prizm Blue Prizms Corey Crawford Chicago Blackhawks. Warehouse Sportscards. You are looking at a2017-18 UD ARTIFACTS HOCKEY COREY CRAWFORD A-28 AURUM INSERT CARD UNSCRATCHED. This card is number 69 from the Base set from 2016-17 Upper Deck Artifacts Hockey. Player - Corey Crawford. Player: Corey Crawford. Team - Chicago Blackhawks. Team: Chicago Blackhawks. Sport - Hockey.